Click image to enlarge Skipanon River, Oregon, looking downstream. View from moving car on Oregon Highway 104. Image taken October 25, 2011. The Skipanon River begins in the Coast Range, is approximately 6 miles long and the watershed is approximately 18,000 acres. 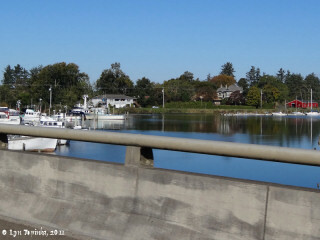 The river runs through the community of Warrenton and enters the Columbia River approximately one mile later at River Mile (RM) 11, at the east side of the mouth of Youngs Bay. Downstream of the Skipanon River and the community of Warrenton is Tansy Point, the community of Hammond, Point Adams and Fort Stevens and Clatsop Spit. 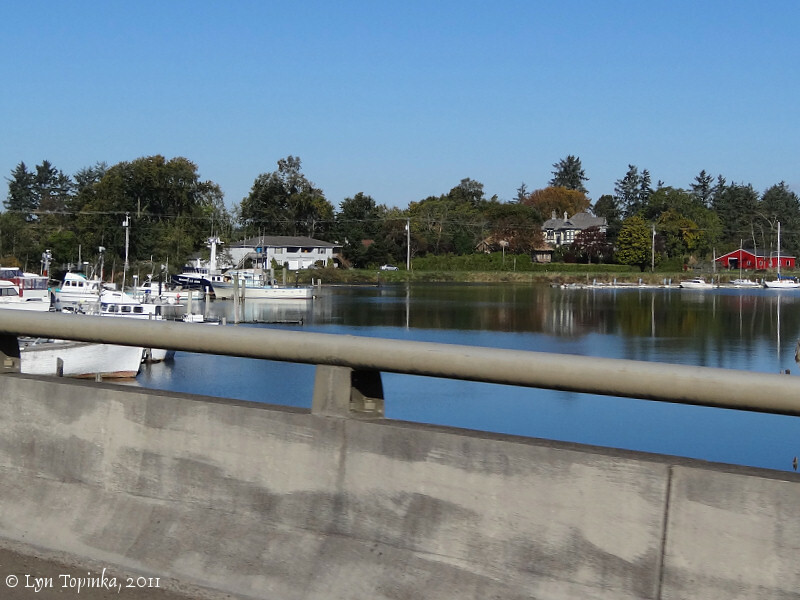 On November 30, 1805, Captain Lewis first commented on the Skipanon River as he explored the Youngs Bay area. 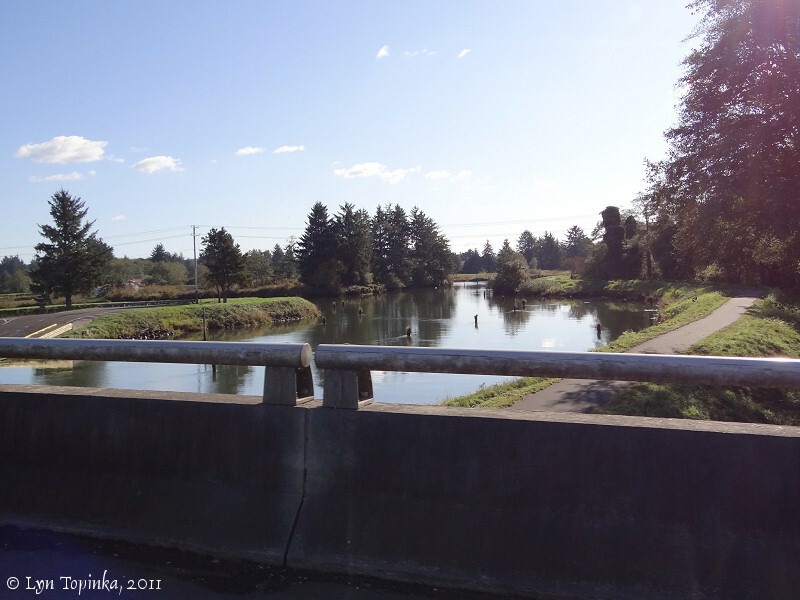 The first 100-yard-wide inlet, and the one to which they returned to expore, is today's Lewis and Clark River. Lewis and Clark called this river the "Skipanarwin Creek" on their route maps. Another spelling seen in the early years was "Skeppernawin Creek". Due to the difficulties of spelling and speaking these names, local use shortened the drainage's name to "Skipanon". The U.S. Board of Geographic Names (USBGN) agreed and accepted "Skipanon Creek". In 1925 the USBGN accepted "Skipanon River". According to Oregon Geographic Names (McArthur and McArthur, 2003), the name "Skippernawin" is Clatsop. Silas B. Smith in the Oregon Historical Quarterly (v.2, p.321) wrote the name referred to "a point at the mouth of the stream rather than to the stream itself". In 1856 Preston's map showed "Skippenon Cr." "... Warrenton, on the Skipanon River, has several sawmills, canneries, and fertilizer works. The Skipanon River has a project depth of 30 feet from deep water to and including the turning basin at Warrenton; thence 6 feet deep for a distance of 4,500 feet, via the cut-off channel, above the railroad bridge. In July 1942, the controlling depth was 24 1/2 feet in the channel and 16 to 19 feet in the turning basin. In 1941, the controlling depth was 6 feet from the railroad bridge at Warrenton to the head of project above the railroad bridge. ... Ocean vessels load here regularly. Warrenton has rail connections with Astoria. ..."
Click image to enlarge Skipanon River, Oregon, looking upstream. View from moving car on Oregon Highway 104. Image taken October 25, 2011.